Do you want a Blacktablet? 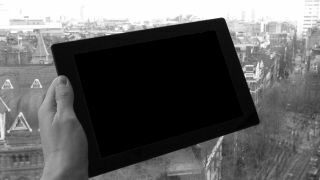 After showing up at MWC 2014, the privacy centric Blackphone went on sale at the end of June, offering customers a far more private Android experience - and now the firm has confirmed it's doing a tablet. Speaking exclusively to TechRadar, Jon Callas, the co-founder and CTO at Silent Circle and Blackphone told us that more devices are on the horizon. Talking about the next step for the Silent Circle - Geeksphone partnership which developed the Blackphone, Callas said: "This isn't our last phone and we're going to do a tablet. There are a lot of enhancements that we need to do. "If you look at what we're doing, it's what I consider a very credible alternative experience which doesn't come with Google - or anything else - and we need to address those things." While the current Blackphone runs core Android, it is not Google certified which means no Google apps or integration, although for some users that's just the way they want it. "It takes time [to get Google certified], but not everyone wants a Google experience. We wanted to start with the higher privacy thing," Callas told us. This is just the start though, as Callas explained going forward a variety of handsets will be offered with differing levels of features and security. Is this the age of the ultra-secure smartphone? "I think [futures handsets will arrive] with different features and different sorts of services on them, because different people have different privacy and security needs." That means those of you who still want your Google fill and some additional security on the side should be able to pick up a Blackphone which covers both bases in the future. Callas didn't have anything to announce regarding any potential wearable device, but he did confirm they were keeping an eye on the sector. "I think so far [wearables] are relatively passive, they are accessories to your phone rather than fully fledged devices themselves. That will change in the next few years. "The new Google devices are almost full devices on their own. We have no idea what Apple is doing with Watch - it's a very pretty device, but there are so many questions about what it actually is. "I think there is a future for wearables, but we're currently at the cusp where the promise is a lot more than the reality."